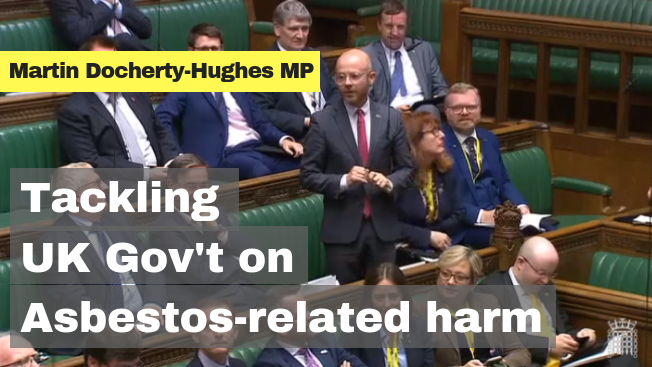 SNP MP Martin Docherty-Hughes has demanded answers from the UK government over fears that military and civilian personnel may have been exposed to asbestos from Sea King helicopters. The MoD has recently announced it is investigating concerns that staff working on Sea King helicopters between 1969 and 2016 could be at risk from asbestos related illnesses due to exposure to the deadly fibres from component parts. It’s unclear how many former and current MoD workers are affected, but it is likely to be thousands as it covers a period of almost 50 years from when the aircraft first came into service. Martin Docherty-Hughes, who sits on the Commons Defence Select Committee, raised concerns about the investigation with Tory Defence Minister Stuart Andrew during defence questions in parliament this week. The MP for West Dunbartonshire, whose constituency has the highest percentage of asbestos-related disease per head of population, has tabled a series of questions in the House of Commons on the presence of asbestos in Sea King helicopters. The UK government has been urged to ensure that the MoD completes its investigation without delay and all those affected are medically assessed and given access to fair compensation. “Asbestos kills, and it is a silent killer. As an MP representing a constituency with the highest rates of asbestos related disease in Europe, I know all too well the devastating and deadly impact it can have. “The MoD has a duty of care to its current and former employees and must ensure that a thorough investigation into asbestos on Sea King helicopters is completed as quickly as possible. “Important questions remain over the number of military and civilian personnel put at risk over the past 50 years, and why it is has taken so long for the MoD to take action. “It’s imperative that those who may have been exposed to these deadly fibres are notified and medically assessed for asbestos-related illnesses without further delay.